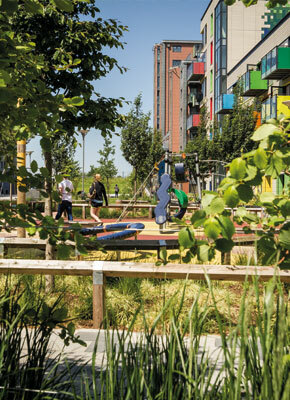 Our green principles have also been applied to the soft landscaping in the Village aiming to combat high priority urban issues such as global warming, sustainable development as well as to provide important green space to Tottenham Hale. Working with award winning Landscape Architect, James Waterton, the plants and trees chosen, where possible, have been sourced from locally native genetic origins to improve local biodiversity and habitats. The soft landscaping for Hale Village predominantly applies to four character areas. Raised planters using multi-stemmed Birches as a background for large patches of specimen shrubs and grasses create interest all year. Other planting includes a line of Red Cornus Albas to provide vertical interest along the fence boundary and Bergenias, Dogwoods and Deschampsia grasses which contrast beautifully. The planting for these were inspired by the river in the context of Pymme’s Brook and the Lee Valley Regional Park and include parkland specimen trees that promote visibility, form, texture and colour. The planted areas consist of woodland planting and low ground cover grasses. The trees within the Park provide shade and shelter and give a presence to the space by linking the ground to the surrounding buildings. Tough evergreen shrubs have been chosen to provide year around interest and structure adjacent to Vicars and Albemarle court. Around the playground a selection of ornamental grasses spring up from the ground. The planting in Perkyn square is very sustainable, with large shrubs and grasses providing a permanent presence to the borders. The Western Boundary forms part of an ecological corridor for wildlife which provides many habitats from evergreen climbing shrubs to wildflower meadows. The planting in this area has been left to naturally develop and evolve with wildflowers and larger perennials. Hale Village streets contain trees that are suited to an urban environment which can even remove dust pollutants from the air. 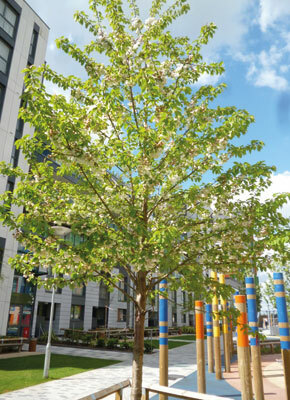 The guidance for street trees was based on the Haringey Tree Strategy 2008-2011 using ornamental pears and Acers for autumn colour. We use a manual mower on the lawn areas to reduce our petrol use and to recycle grass clipping back into the lawn. The grass clipping rot down and feed the lawn with nutrients. Using a manual mower also helps to reduce noise pollution in the park.